The city of San Antonio was treated to another excellent night of boxing with Knockout Kings II. Thurman, Figueroa and Soto-Karass scored impressive wins in fights that tested the will, heart and determination for all six fighters. After a night like this, it would be no surprise if fans are already looking forward to Knockout Kings III! As with most contests, there are winners and losers. 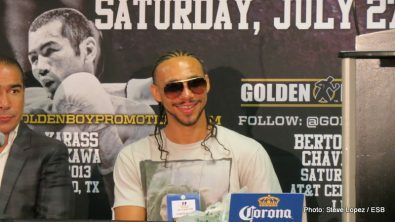 Thurman’s performance earned him the Knockout Bonus Prize as he dispatched Chaves in 10 rounds. The bonus was no easy task to win for Thurman as the Argentina fighter tested him early in the fight causing Thurman to adjust in the second part of the bout en-route to a 10th round knockout. 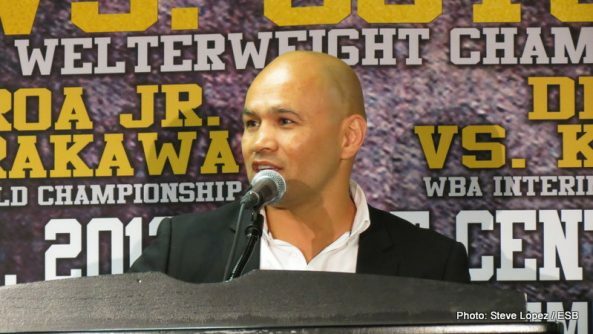 Figueroa and Arakawa engaged in what is easily one of the leading candidates for Fight of the Year. The fight had all the elements that kept the viewers, both at home and the arena, on the edge of their seats: blood, knockdowns, injuries and toe-to-toe exchanges. Though Figueroa was crowned with the Interim WBC Lightweight title via unanimous decision, everyone won in this fight. Both fighters’ stock rose and the fans appreciated every single round. A triple win-win-win result. In a crossroads fight, Soto-Karass scored the last KO of the night against Andre Berto in the 12th round. Soto-Karass must’ve taken notes from Robert Guerrero as he applied pressure throughout the fight. Berto’s reaction to the punishment dwindled as the fight continued as his fights with Ortiz and Guerrero seem to have taken a toll on the Haitian. 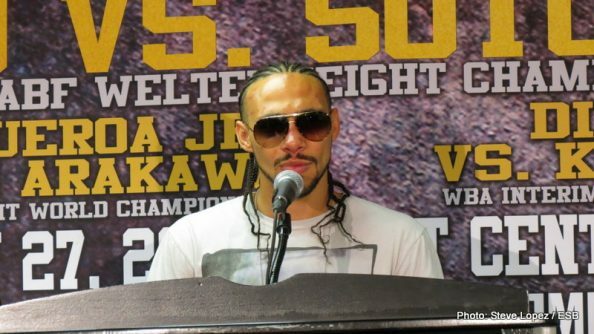 In the post fight press conference, only Thurman and Soto-Karass attended. 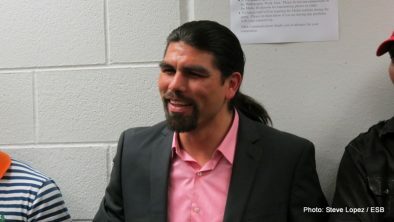 Alfredo “El Perro” Angulo made a guest appearance. Figueroa and Arakawa were taken to the hospital for precaution after their brutal war. Here are some notable quotes from the post-fight press conference along with a recap of each fight from the tripleheader. The tripleheader began with U.S.A VS. Argentina: hard-punching Keith Thurman against Argentina’s Diego Chaves. The opening round did not disappoint. Both came out looking at making their presence felt with neither being gun shy. The third round was the round that set the tone: Argentina was not going to back down. Through a buildup of body shots, Chaves began to land the better shots upstairs. Rounds 4, 5, and 6 were the rounds that Thurman began to turn the tide. A combination midway through Round 4 caused Chaves to be a different fighter. Thurman began to land the harder shots with combinations and counter left hooks. The first knockdown of the fight occurred towards the last part of Round 9. A crushing left hook to the body of Chaves made him drop to his knees. At first, it seemed as if Chaves would not get up, similar to the first Gatti-Ward fighter where Gatti took a knee after a vicious body shot by ward. But, like Gatti, Chaves was able to beat the count and survive the rest of the round. The end came at 0:28 seconds of Round 10. Thurman, seeing that Chaves was still hurt from the body shot, he came out looking for the kill. Through combinations, Chaves made his way to the ropes and dropped to his knees. This time, Chaves was not able to beat the count and Thurman captured his KO win. Chaves remained on the floor after the bout was waived off. With the win, Thurman improves to 21-0 (19 KO’s) and captures the WBA Interim Welterweight title. Figueroa undoubtedly established his presence in Round 1. Combinations to the body and upstairs kept the Japanese warrior on the defensive for most of the round. Nihito landed some shots, but not to the extent where Figueroa would respect him. After tasting Figueroa’s power, Arakawa began to hold often to evade Figueroa’s inside game. Round 2 produced the first knockdown of the fight as Arakawa dropped to his knees from a combination from Figueroa. Rounds 4 and 5 produced the most fireworks thus far in the fight with both fighters giving and taking. Though “Panterita” was the one with the heavier punches, Nihito began to invest in body work that kept Figueroa on the ropes with hands getting lowe and lower. A cut on the bridge of Omar’s nose showed the story: this was a war. Round 6. Arakawa smelled the blood and showed his determination with more aggression. He was determined to make the young buck respect him. The Texas crowd maintained Omar on his feet as he fought back against the tough Japanese. The second knockdown occurred towards the last third of the fight. Figueroa’s effort paid off as he gained confidence in his punch. The “Baby Faced Sniper” did not let the knockdowns discourage him in Round 7 and 8. The Japanese bulldozer effort continued with Figueroa tiring and slightly lazy with punches. Arakawa’s left eye began to swell up from the right bombs landed by Figueroa. Both fighters continued to have their moments in this barn burner. Round 10 was perhaps the slowest round of all as both fighters fought in spurts looking for a breather. But that all changed in Round 11. The Japanese warrior had Figueroa in trouble towards the second half of the round. The first round where “Panterita” seemed legitimately in trouble. Spending most of his time against the ropes, Figueroa seemed almost out. But, his warrior heart showed towards the end of the round as he made his way out of the ropes with combinations of his own. How could these fighters continue? The crowd was in awe as the final round began. Same story as the rest of the later rounds of the fight. Both fighters having their moments and hurting their counterparts. At the end, Figueroa had the face of the fighter taking the most punishment. The bout went to the scorecards. A unanimous decision for “Panterita” with scores that seemed wider than expected. Figueroa captures the vacant WBC Interim Lighweight title. He dedicated his fight to all his fans and especially his daughter: he sported his unique trunks with his daughter’s three initials on the back. Round 1 was a feeling out round for both fighters. That was until Soto-Karass landed an overhead right of his own towards the last third of the round. Berto’s legs wobbled and was on the retreat, but able to finish the round. Round 2 was a better round for Berto as he was able to land his signature right uppercut and counter right hands. Soto-Karass gained some steam in Round 3 as he began to land overhead rights. The effect on Berto was the same as the legs began to buckle towards the end of the round. Sensing the reaction of Berto, Soto-Karass upped the pressure and continued his inside work with body punches and uppercuts, reminiscent of Guerrero-Berto. Soto-Karass won the round big. Round 4 and 5 continued with the Mexican bulldozer applying inside pressure. Berto showed glimpses of his explosiveness with quick uppercuts and punches in between the Soto-Karass combinations. Though still taking punishment, Berto had somewhat of a revival round in Round 7 in comparison to the previous rounds where he was almost out on his feet as he landed more punches and combinations making Soto-Karass respect him a little more. His best round yet. Round 11 produced the first knockdown of the fight. Soto-Karass went down from what seemed to be a low body shot. Complaining of a low blow, the Los Mochis warrior rose from the ground and chased the Haitian as he applied pressure looking at making it a 9-9 round. 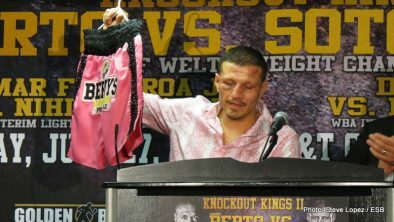 The final round brought the fight to a brutal halt as Soto-Karass landed a quick left that drilled Berto to the floor. Berto quickly rose from the ground to show the referee he still had it in him, but the bout was quickly waived off. Perhaps an early stoppage as, but the referee must’ve seen something that could not be seen sitting ringside. Berto’s faced told the story as he was swelled up from all the punishment throughout the rounds. Berto feels at least eight-count was due. 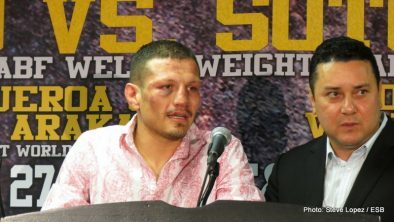 Next boxing news: Jesus Soto Karass: Give This Man A World Title Shot!